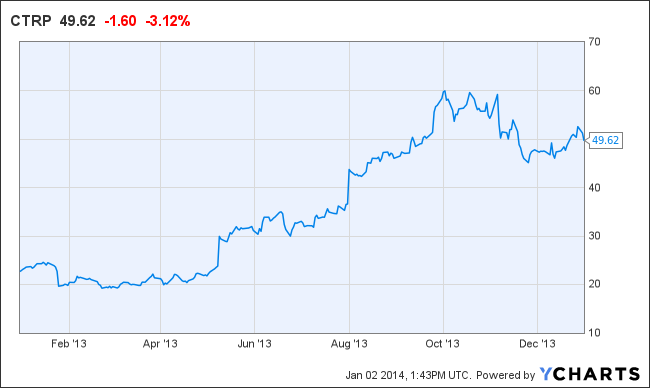 It was a great year on the stock markets in 2013 for online travel agencies as a whole. Their businesses are increasingly global, and many are benefiting from expansion into developing markets and boosting their hotel products. Priceline deservedly got most of the attention among online travel agencies in 2013 as its share price shattered the historic $1,000 mark in September and closed the year up 78.1% at $1,162.40. But, leapfrogging-bragging rights for the year goes to lowly Orbitz Worldwide, which closed out the year with its stock price increasing 149.3% to $7.18. 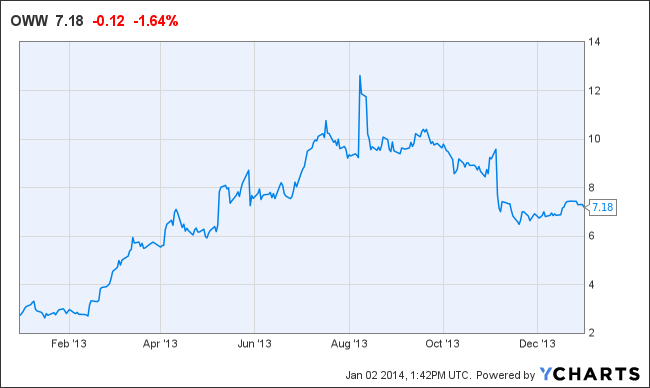 Orbitz has a long way to go: Priceline’s shares could lose $7.18 in a day without breaking a sweat. Orbitz made some strides in 2013, shifting some of its revenue mix toward hotels, notching some private-label wins and patching up one of its brands in Australia, but its room-night growth was lackluster and its sales targets for 2014 are sub-par. After Orbitz Worldwide, China’s leading online travel agency, Ctrip, showed the most kick in its share price for 2013, closing at $49.62 on December 31, a 116% increase over its opening stock price for the year. In the highly competitive China online travel market, which also includes Expedia-controlled eLong and Baidu’s Qunar, Ctrip has matched or beat analysts’ expectation over the last eight quarters. TripAdvisor isn’t an online travel agency, but we include the company here because its prospects are closely tied to online travel agencies, which are TripAdvisor’s best business customers. 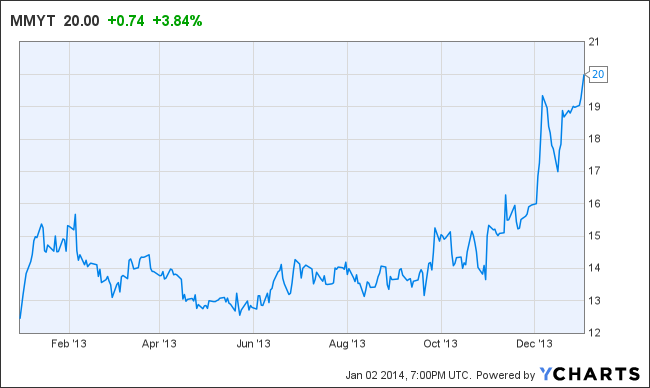 The hotel review and metasearch site saw its stock price rise 88.2% to $82.83 by end of 2013. TripAdvisor had its stumbles in 2013, with its transition from pop-under ads to Kayak-like hotel metasearch still a work in progress, but overall investors are bullish about its global growth prospects. Priceline continued on its humongous growth trajectory, its increasing its room nights 36% in the third quarter and edging past Expedia in gross bookings for the first time despite incessant warnings that its growth rates are bound to decelerate because of Priceline’s sheer size at some juncture. 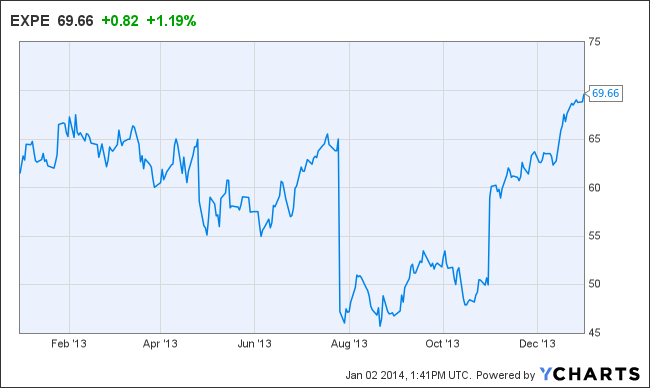 Despite its girth, Priceline’s stock price rose 78.1% to $1,162.78 by the end of the year. January 4, 2013 opens at $652.59. MakeMyTrip, which competes in India with the smaller Cleartrip, among others, has been coping with the volatility of the rupee and domestic airfares, but projects 15% to 20% revenue growth into 2014. Like others, MakeMyTrip has been trying to increase its hotel and package bookings. They are on the upswing, but remain a relatively small portion of the business. eLong produced an impressive 100% growth in total revenue in the third quarter as parent Expedia invests in its China holdings, although profits aren’t the priority at this juncture. The China online travel market is hyper-competitive with lots of coupling/discounting taking place, as eLong is making a big push into mobile. 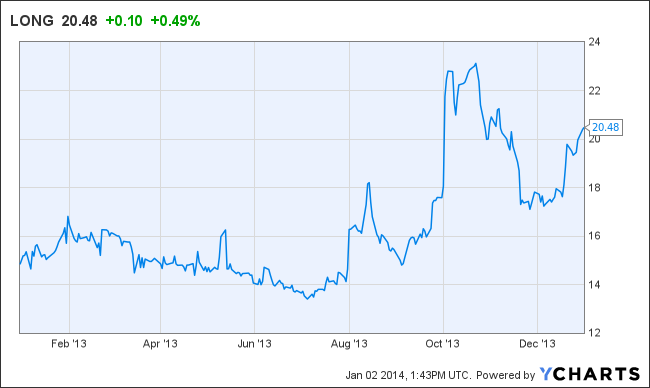 January 4, 2013 opens at $15.20. Expedia Inc. saw the slowest growth in its share price among the publicly traded online travel agencies at a tepid 10.37%. Its well-documented stumbles during 2013 included an under-performing Hotwire, difficulties in getting its messaging as competitors dominated offline advertising, and marketing challenges in adapting to TripAdvisor’s transition to hotel metasearch. 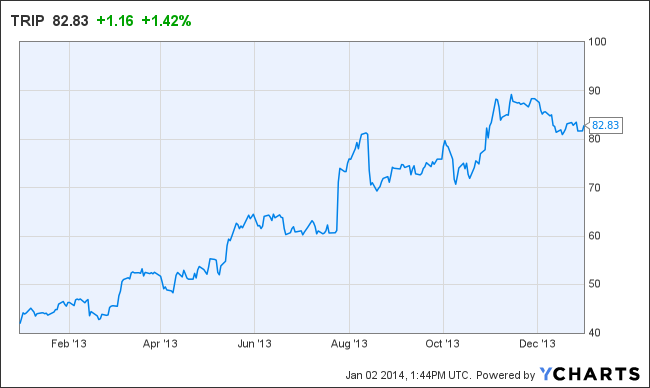 Some observers, though, think Expedia could have a big 2014 in store. 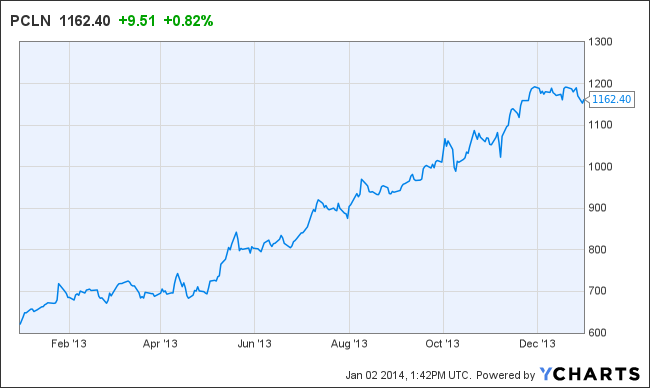 January 4, 2013 opens at $63.11.